The simple template, with its combination of locked and editable regions, truly reflects the reality of many Web pages where the overall structure is constant and the details of the content vary. Often, however, a single locked area is too rigid to really be useful in a complex site. Suppose for a moment you're working on a site for a magazine publisher with multiple brands. The client wants a general look and feel for the entire site with separate navigation and content for each magazine. One way to achieve this effect is to use multiple templates — one set for each magazine, all incorporating the parent-company style. The problem here is that to affect changes on the highest level, all the templates need to be changed. Another way — a better way — is to use nested templates. Nested templates allow template-based documents to have numerous tiers of locked regions. With nested templates, the magazine publisher in our example could make a change to just the master template and the modifications would ripple through all the other magazine-specific templates and on down to their related pages. Best of all, there's no real limit on nesting templates: Your template-based files can be as deeply nested as you need them to be. A new page based on the master template is created and saved as a template; this new document is the nested template. Within the editable areas originally set up in the master template, new editable areas are placed. All areas not designated as editable in the nested template are locked. A new document is created, based on the nested template. 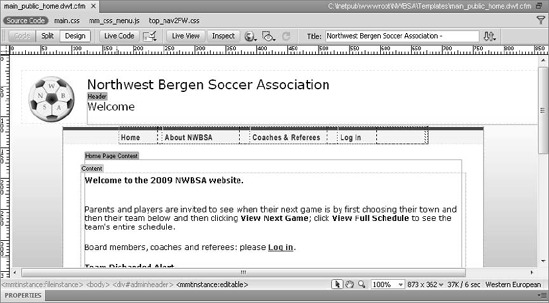 The only editable areas are those inserted in the nested template. When modifications are made to the nested template, the changes are reflected in the pages based on that template. When modifications are made to the master template, the changes are applied to both the nested template and to documents based on the nested template. Dreamweaver employs a color-coding system to help you differentiate editable regions inserted in the master template from those added in the nested template. Although you can't tell it in this black-and-white screenshot, the master template editable regions are shown in orange, whereas nested template editable regions are shown in blue (see Figure 1). Create a master root-level template by choosing File => Save As Template for an existing page or selecting New Template from the Template category of the Assets panel for new documents. The master template contains all the elements — navigation, logos, footers, and so on — common to all template-based pages in the site. Insert editable regions wherever variable content is desired in the master template and save the template when you're ready. Choose File New to open the New Document dialog box. Make sure the current site is selected in the Templates For list. Select the desired master template from the Template list. Figure 1. The master template editable region — the region in the center here — is highlighted with an orange outline. The nested template editable regions, the outside regions, are blue. Save the newly created document as a template. By saving a template-derived document as a template, a nested template is created. In the nested template, make any changes needed within the editable regions. These changes are locked in any document based on the nested template. Add any desired template regions (editable, repeating, or optional) within the existing editable regions from the master template. When the first editable region is inserted in the nested template, the editable regions from the master template turn orange to differentiate them from the new regions. After you've finished adding the desired template regions to the nested template, save the file. Now, when creating documents based on the nested template, you are still able to modify content within an editable region — but only those editable regions added in the nested template.